On November 2, 2017, Bill 145 (WSIB Coverage for Workers in Residential Care Facilities and Group Homes act) passed second reading at Queen’s Park. Second reading is one of the final steps before an act becomes law. Unfortunately, due to the 2018 Provincial Election, Bill 145 never passed into law. 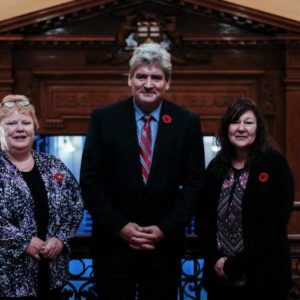 This Bill would have mandated Workplace Safety and Insurance Board (WSIB) coverage for all developmental service workers (DSWs) in group homes, day programs, and all workers in retirement homes. WSIB is a government regulated insurance policy for workers who get injured on the job. Without WSIB, workers must battle with private insurance companies for compensation, making an already stressful situation much worse. While WSIB is far from perfect, every healthcare worker deserves support and compensation after a workplace injury. SEIU Healthcare members Sandee Green, Jackie Haynes and many others from across the province came very close to changing the law. We’re not giving up now! But, your help is needed to make sure our MPPs know about the lack of WSIB coverage for group and retirement home workers.